Darren and I were overjoyed to discover I was pregnant with our second child. It had been a tough year as my mother was diagnosed with breast cancer but when she got the all clear in April 2016 we decided to try for a sibling for our oldest boy Charlie and another baby for us to cherish. July 8th 2016 was a very special day for the three of us as we discovered there will be four…. Yes I was pregnant! We already knew with Charlie the absolute joy he brings us and I was so excited to be carrying a brother or sister to grow up with Charlie as their big brother. Due date was March 9th 2017 just three weeks after Charlie’s second birthday. Just like my first pregnancy I hadn’t any morning sickness. On reflection, I did say to family and friends that I didn’t “feel” pregnant and thought it’s no wonder some women choose to have a large family if it was this easy. However I was always nervous about the birth as my mother had a baby that was stillborn and she should never had natural labours, baby Gerard died as a result of the cord around his neck while she was In labour. At 18 weeks I had a scan in my local hospital and was told everything was fine. At this time there was an inquest into the death of a baby in this hospital and the outcome was to provide anomaly scans for all pregnant women there. I had never heard of anomaly scans before this but I suddenly started thinking if I get an anomaly scan and there’s something that needs attention we could have the baby in Dublin and he would be seen to. Looking back, I wonder did I have an inkling something was not quite right. We went home and I spent my whole time wondering at what minute our baby’s heart would stop. I googled signs of a miscarriage and kept looking for signs. We were in turmoil, I started wanting the baby’s heart to stop, I couldn’t imagine going through 18 weeks of pregnancy to have no baby to bring home. We discussed a termination but came to the decision that this was a much wanted pregnancy and we would let nature take its course. We told our immediate family and that weekend our house felt like our baby had already died, it was repeating what we had been told, making cups of tea, hugs, crying and flowers everywhere. I asked my partners mum to knit the baby a hat, blanket and cardigan. We received the results in the post the following week to confirm our baby definitely had Trisomy 18. I decided to continue working and did so right up to two weeks before Noah was born. Keeping everything as “normal” as possible kept me sane. I told some friends and as time went on if it felt right when someone asked about the pregnancy I told them. I contacted some charities for support – SOFT and ALLFI. I found wonderful support through other women in the Under the Rainbow private support page. A midwife contacted us from Cavan General Hospital after receiving the results from the Rotunda and asked if we would meet with our consultant and the bereavement nurse specialist. I never knew such a nurse existed. She was our absolute rock. She met us at every appointment and ensured all of our needs were met. Every member of staff we met at the hospital were so compassionate to us. We had a scan every fortnight and also went for private scans to get videos as we didn’t know at what minute our little boys heart would stop. We picked the name Noah which means provider of rest and comfort. It was so different picking his name, with our first child we waited to meet him and get to know his personality. But it was very important that this baby’s name had meaning. The month of December was the toughest ever, I cried rivers for the little boy that I would never get to see growing up. Everything Charlie did I realised I wouldn’t get to see Noah do. It broke my heart to read him bedtime stories and feel Noah kicking inside. Noah was happiest in my womb and was not suffering there in any way. I wished for him to just stay there forever. We were told that this was our time with our baby and to create memories, it was so difficult to comprehend this. We put the Christmas tree up early, we went to visit Santa, and we went to Galway just as we had done when pregnant with Charlie. Making memories became very important. Christmas came and went and we had a lovely day, wanted it to be as happy as we could for both our boys. The bereavement nurse specialist was with us all day and she took photographs & videos from the moment he was born. I am so proud of my little boy to say he gave us more than minutes, he gave us 20 hours. However, just after three minutes the nurse placed my baby on my chest and told us his heart was very weak and was going to stop. We both cried while holding him and it was captured on video me telling him to go if he had to go. It just felt selfish making him stay if he had to suffer. But he continued to fight and the doctor said it was the skin to skin with me that helped him. The priest arrived in to the theatre and baptised him. We then went back to our room where the Now I Lay Me Down to Sleep (NILMDTS) photographer took the most precious photographs. Our families arrived and got to meet him and we captured a lot of our time with Noah on camera and video. Looking back it really felt that our baby was only borrowed to us, we knew every second counted. The next morning the nurse took Noah to the Special Care Baby Unit to check out why he couldn’t feed. Darren went too and a few minutes later I was sent for as Noah’s heart had got very low again, I held him in my arms and told my baby that it was ok to go, not to suffer. We loved him so much we couldn’t bear to see him if he was in pain. It was very peaceful. We had to spend the next two days in hospital for me to recover. We had more family come meet him and we sang to him and talked as much as we could. We got to take him home for a night before the funeral and used the cuddle cot we had used for the two days and nights we stayed in hospital for me to recover. On a beautiful sunny Monday morning we laid our baby to rest. Our friends played traditional music and played the tune of The Waterboys ‘How long will I love you‘. We carried our baby down the aisle to Eva Cassidy’s song ‘Somewhere over the rainbow‘. It’s just gone a year since we met and then had to lay our baby to rest. I would do it all over again just to have seen, smelled, touched and all the other things we generally take for granted when we meet our babies for the first time. I believe now everything we went through before Noah’s arrival has been part of the healing process. I call him my forever baby. The pain of losing him is still so raw and it certainly has put a different perspective on our lives, our baby has enriched our life. We have a new circle of friends that we would never have met only for our darling angel…. These are people that understand what we have gone through & continue to go through. 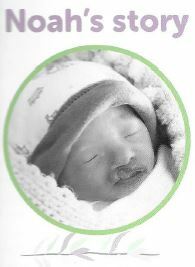 We have met these people through Support Organisation for Trisomy (S.O.F.T. ireland), A Little Lifetime Foundation (ALLF), Féileacáin and by making contact through the Under the Rainbow private Facebook page. Linking in With mothers who unfortunately have also been on this journey after the diagnosis got me through those days and helped me realise we can get through this. Talking is healing for me and our family and friends have been there for us throughout & continue to be. I feel blessed that I got to see for myself that our baby wasn’t fit for this world, it has definitely helped me accept it more. I feel him with me and I get signs from him. Yes there are days I am angry that I need a sign from my baby, after all I’m the parent and he’s the baby. But this is our journey, I believe this is how it was meant to be and that puts me at ease. I hope by telling our story we can help someone on this difficult journey of grief. In memory of our darling son, our forever baby x.